“…I think there’s actually quite a lot in Persepolis to provide food for thought for a wider discussion about how and why attempts at genocide can occur. The book reprints the two original books – “The Story of a Childhood” and “The Story of a Return” – together. Certainly the second book focuses more on Satrapi’s personal journey, but the first book gives an excellent first-hand account of Iran’s recent history. The history of Reza Shah and the British manoeuvring for oil is interesting (as is the fact that “Iran” comes from the term “Aryan”), but starting with the Shah’s return to power, there are insights into human nature and how dogmatic regimes can grip a country. The Shah was an oppressive regime (see p.14 – locking people in a cinema and razing it to the ground) which routinely imprisoned and tortured those who opposed it (p.50 etc). Through the work of the country’s leftist revolutionaries, the Shah was toppled in the 1979 revolution. However, rather than the enlightened liberalism or communism which the revolution envisaged, somehow the hard-line Islamic fundamentalists took power. The same revolutionaries who were freed when the Shah was toppled were re-imprisoned or simply murdered (see p.65, or 66 – where the innocent sister of a revolutionary is murdered “in his place”) by the “Guardians of the Revolution”, enforcers for the Islamic Republic. p.62: “in a country where half the population is illiterate you cannot unite the people around Marx. The only thing that can really unite them is nationalism or a religious ethic”. This is spoken by Anoosh, Satrapi’s communist uncle who is eventually imprisoned and executed. We see that it’s not just about wearing a veil, it’s a total lockdown against the progressive “westernised” values and freedom of expression and thought, and those who break the rules (e.g. owning deck of cards, a chess set, alcohol, anything forbidden by the regime), could find themselves being imprisoned or tortured (p.105). What’s interesting is that this repression is not based on differences in ethnicity or even religion (well, partly, I suppose) but mainly on differences in ideologies. What are the links with other situations like this? Dogma and fundamentalism, and a populace too willing to embrace a new regime before its true nature is revealed. The situation is further complicated by the war with Iraq. Even whilst militarily and politically engaged with this outer foe, the internal oppression continues, so much so that Satrapi is sent to Austria by her parents. Now, as mentioned, much of the second book (“The Story of a Return”) is focused on her personal story, although her “armchair anarchist” associates offer another insight into unfounded idealism. However, when she returns to Iran, she finds out what has happened since she left. In addition to the war, the threat of liberators releasing the political prisoners of the Islamic Republic regime prompts the execution of tens of thousands of them (p.259). 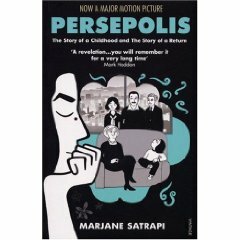 The remainder of the book detailing her time under the increasingly ludicrous (see p.303: Satrapi, in full conservative attire, is ordered by a policeman to stop running for a bus because ‘when you run, your behind makes movements that are… how do you say… obscene!’) and violent government. “The regime had understood that one person leaving her house while asking herself ‘Are my trousers long enough?’ ‘Is my veil in place?’ ‘Can my make-up be seen?’ ‘Are they going to whip me?’ no longer asks herself: ‘Where is my freedom of thought?’, ‘Where is my freedom of speech?’, ‘My life; is it liveable?’, ‘What’s going on in the political prisons?’”.